Long-term climate and annual weather are the key factors determining weed populations in a region, but herbicide practices play a major role in shaping the weed community in each field. Christian Willenborg of the University of Saskatchewan led a three-year study in collaboration with Julia Leeson of Agriculture and Agri-Food Canada (AAFC) in Saskatoon. The study looked at weed abundance, species distribution, community diversity and function in canola-inclusive rotations across Western Canada and their relationships with management practices, canola frequency in the crop rotation, and diversity of the crop rotation. The project combined field data from an AAFC rotation study in Alberta in 2011 and 2012, a survey of 464 Saskatchewan fields in 2012 (see Table 1), and mining of long-term weed survey data from across the Prairies. 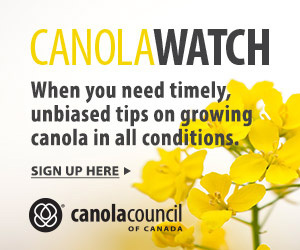 Weed species diversity and overall weed numbers tended to be lower in rotations with a high frequency of canola. Relatively few weed species (other than volunteer canola) were associated with continuous canola. However, the risk of developing herbicide resistant weeds under continuous canola production is high and extreme caution must be used when incorporating a risky practice such as this into a cropping system. Field survey results showed that the canola herbicide system did not have a significant impact on species diversity. The strong influence that weather has on weed diversity was demonstrated in two Saskatchewan field surveys: Under the dry conditions of 2003, weed species richness was lower than ever previously recorded. Under the wet conditions in 2012, weed species richness was higher than ever previously recorded. However, the timing of herbicide application and rotational diversity also significantly influenced weed diversity from field to field. The study concluded that a spring burnoff application is essential in tight canola rotations. It is also essential that producers use more than one mode of action for resistance management. Rotational diversity should not be discounted due to the many critical agronomic benefits it brings over the long term. A weed management plan that includes herbicide rotation, different herbicide timing and crop rotation will also lead to better resistance planning and a slower evolution of resistance in the field. Greater rotational diversity does not always lead to fewer weeds in terms of population numbers, but it does generally reduce the likelihood of resistance issues. This should be an important concern for growers in tight rotations where the risk of developing glyphosate and/or glufosinate resistance is real. Table 1. Top ten abundant species in 2012 Saskatchewan canola (464 fields).